Brazil’s education minister has said school textbooks will be rewritten "to deny" the country’s 1964 coup and 21-year military dictatorship. Ricardo Vélez said the military ousting of democratically-elected president João Goulart was not a coup and the following two decades of military rule were in fact a “democratic regime of force”. His comments came just days after far-right president Jair Bolsonaro reversed an eight-year ban on commemorating the anniversary of the start of military rule, allowing celebrations to go ahead on Sunday. Mr Vélez told business newspaper Valor Económico there would be “progressive” changes to textbooks to give children a “true, real idea” of what happened. “Brazilian history shows that 31 March 1964 was a sovereign decision of Brazilian society,” he said. He has since been accused of historical revisionism. The president of the Brazilian Association of Textbooks, Cândido Grangeiro, was critical of the plans, saying the organisation was opposed to “any type of revisionism based on opinions”. A 2014 report by the country’s truth commission found that at least 434 people were killed or disappeared during the military regime. None of the military officials in power at the time have been prosecuted. Some, including Mr Bolsonaro, believe the military intervention saved the country from communism. 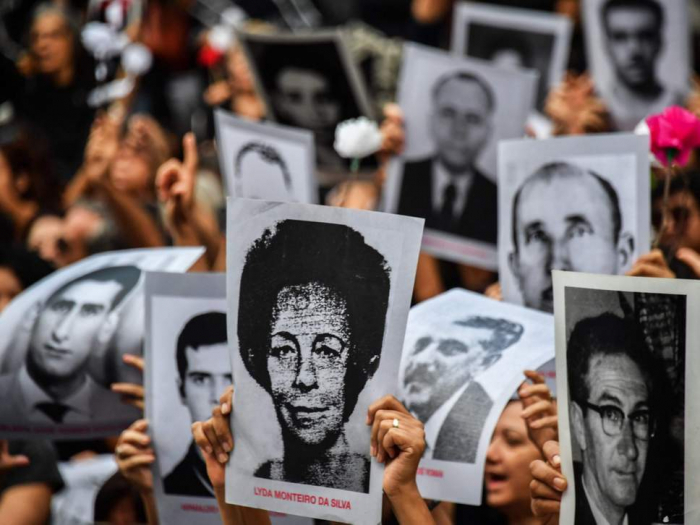 However thousands of demonstrators took to the streets in several major Brazilian cities on Sunday to protest the 55th anniversary of the coup. In the nation’s capital Brasilia, protesters marched chanting “dictatorship never again”.